The news this past month of an innocent fisherman being randomly pushed into Montrose Harbor has been particularly disturbing. The lake front has always been a great place for families to hang out. 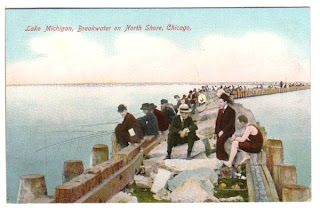 This postcard image shows fishermen nearly a hundred years ago enjoying Lake Michigan on a summer's day. My dad told me how, in the days before air conditioning units were common in homes, he and his siblings and friends would either sleep on the roof of their six-flat in hopes of catching a breeze or camp out on the beach with hundreds of other Uptown and Edgewater residents who were trying to escape the dog days of August. This would have been back in the 1950s. While I can't quite picture myself ever feeling safe enough to sleep on the beach (disregarding, of course, the fact that you can't even do that anymore), and while I wouldn't go there at night alone, I have always felt comfortable walking along the lake in the daylight. It's events like this random homicide that make you think twice about your personal safety. I often go to the beach alone, at night.